Origin Diagnostics has several different Alcohol Testing Products, Including our Alcoscreen Instant Saliva Swab, Breathscan Instant Breath Alcohol Test, and our Laboratory Breath Alcohol Test. Please feel free to contact us for bulk pricing rates. Easy-to-use and inexpensive, simple, one-step test, no instrumentation, or training. Packaged individually in a sterile, and pouch bag. 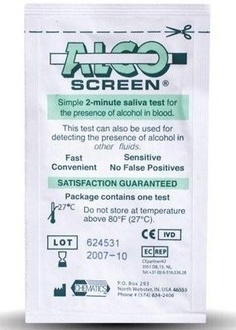 Alcoscreen is a rapid, highly sensitive method to detect the presence of alcohol in saliva and provide an approximation of relative blood alcohol concentration. Since it is well established that the concentration of alcohol in saliva is very close to that in the blood, saliva is the preferred specimen for alcohol testing, allowing for greater detection sensitivity than breath testing methods. Alco-Screen is a very simple, one-step, 2 minute test requiring no instrumentation, calibration or special training to be used effectively, and is convenient enough to be used any time, any place. It may also be used to non-quantitatively detect the presence of alcohol in many other fluids, such as soft drinks, blood serum, water, etc. It was designed and patented in 1988 as a simple, cost-effective solution to screen for alcohol concentrations. With over 10 million tests, our test has proven to be the leading alcohol screening device in the field. Easy to use and fast…just break internal capsule, shake, and blow hard into the test cylinder for a few seconds. Then read the color change of the chemical crystals in 2 minutes or less! 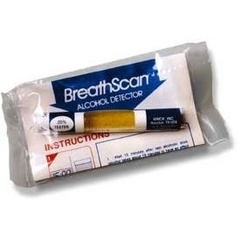 The BreathScan® Alcohol Detector has been on the market since 1987 and, because of its proven reliability and demonstrated affordability, has become the leading disposable device in the breath alcohol testing field. Using indicator chemistry methods, BreathScan® Alcohol Detector alcohol test is used routinely by hundreds of government and private agencies to test for alcohol intoxication, and has a proven track record in quality assurance and control. The BreathScan® Alcohol Detector is considered by many to be the best example of these devices. BreathScan® is a portable, disposable alcohol detector with an extremely low unit cost that makes it suitable for general use in the workplace or other remote locations.